Last minute dinner idea. Always a winner! Salty, spicy, peppery and so tasty! 1. Toasted walnuts: Preheat the oven to 180°C (350ºF). Spread the walnuts on a baking sheet and bake for 5 to 10 minutes, until they are lightly toasted and fragrant (shake pan once or twice while baking). Transfer to a bowl and set aside. 2. Meanwhile, bring a pot of salted water to a boil. Cook pasta until al dente, about 10 minutes or as packet label directs. Reserve 2 cups of the cooking water before draining the pasta. 3. Onion mixture: Melt 1 tablespoon of the butter in a large, deep skillet over a medium-high heat. Add the diced onions and cook, stirring often, until tender and translucent, about 4 minutes. Stir in the garlic and the sage and cook, stirring, for 1 minute. Stir in tomato paste and paprika, until combined. 4. For the sauce: Add the leftover pumpkin soup to the onion mixture and cook, stirring, until well incorporated and warmed through. 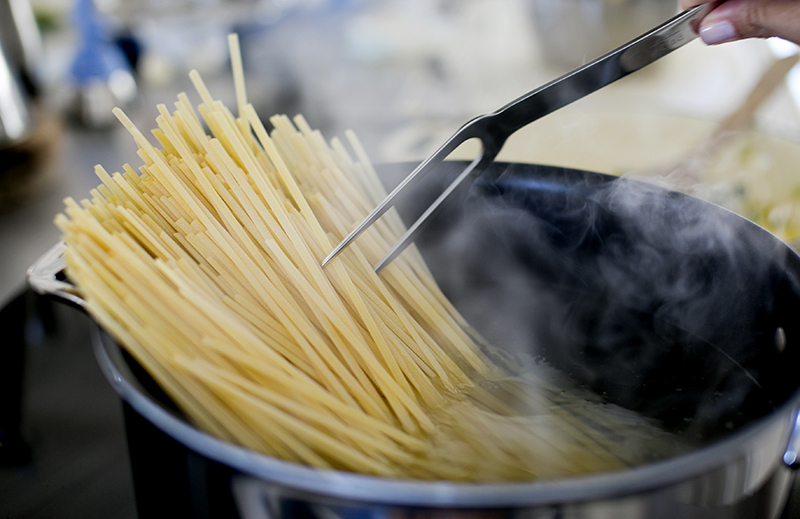 Add reserved pasta cooking water — a few tablespoons at a time — until the desired consistency is reached. Whisk in the yogurt and the remaining 1 tablespoon of butter; cook until the sauce is warmed through and the butter has melted. Taste the sauce and season accordingly with salt and pepper. 5. Toss the pasta with the sauce. Divide among 4 plates and top with Parmesan cheese and toasted walnuts.